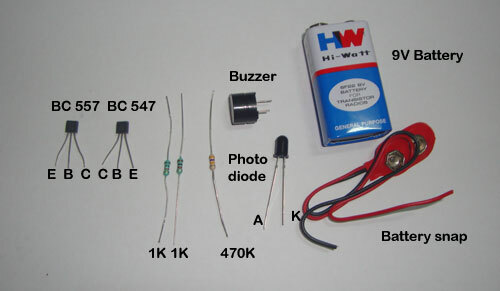 A Photodiode is used as the Flame sensor. It is connected in the reverse biased mode with the Cathode to the Positive rail. 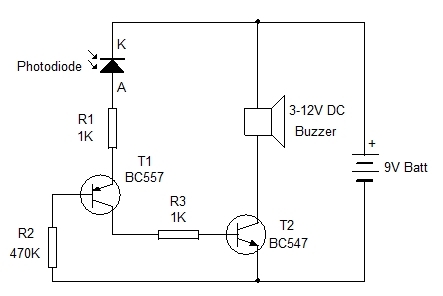 In the ambient light, it passes only 0.84 V through it to the Emitter of the PNP transistor T1. 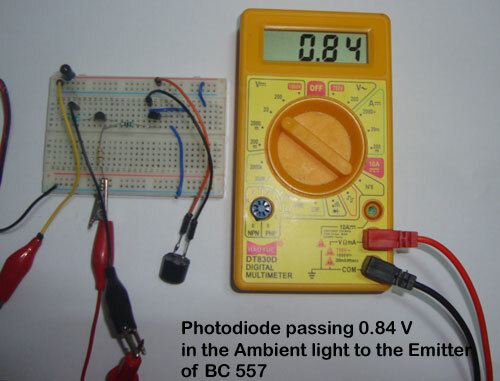 But when the Photodiode gets light from the Flame, mainly the Infrared light, the Photodiode passes more voltage . 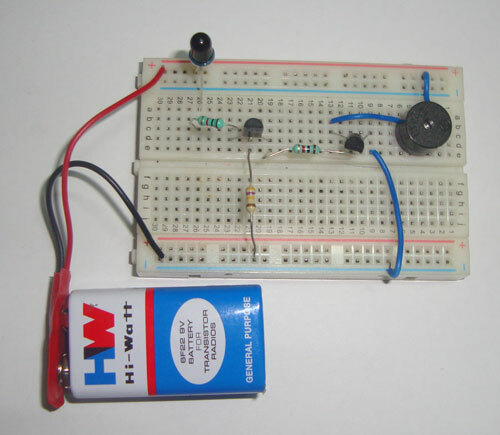 T1 is a PNP transistor, so it conducts only when its base is held low. So here the base of T1 is held low through the 470K resistor. In this state, it can conduct. 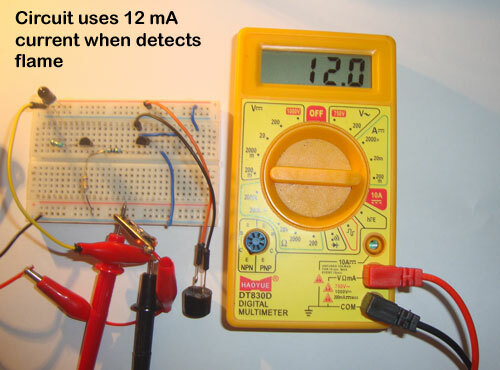 But the Photodiode is not passing current to the emitter of T1. At this condition, T2 remains off since it is not getting any base current from the collector of T1. So the circuit remains standby. 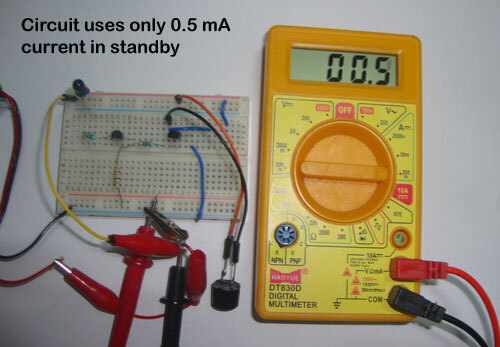 When the Photodiode gets light from the flame, it passes more voltage as high as that of positive rail. So T2 gets base bias from the collector of T1. T1 then conducts and the buzzer beeps. After assembling the circuit on a Perf board, place it an area where there is no sunlight or light from incandescent light. Usually, buzzer remains silent. 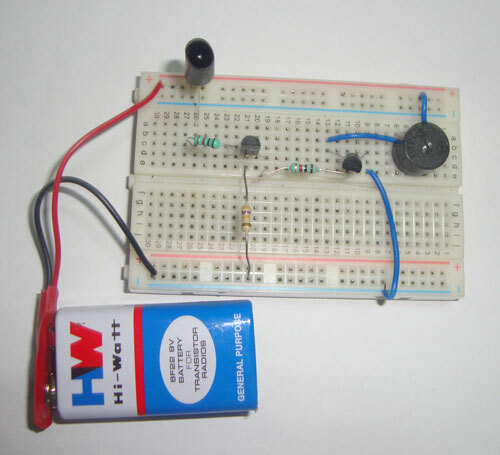 If it beeps, enclose the Photodiode in a black tube. Buzzer will stop beeping. Fluorescent light, LED lights etc will not activate the circuit. 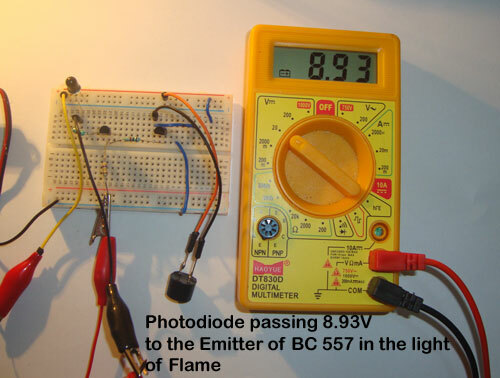 Show a lighted match stick or candle flame to the photodiode. Buzzer will beep. Your Fire alarm system is ready. 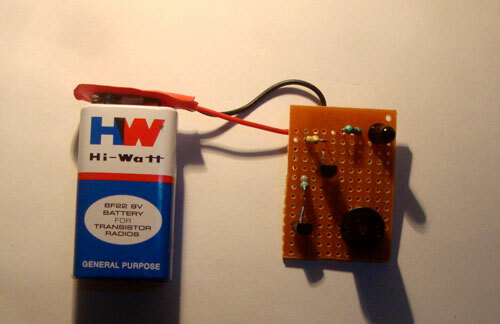 Fix it near the corner of the room .You can also use a 6-9V adapter for powering the circuit.